When I first started sewing I used a universal sewing machine needle for every project. I wasn't going to spend more money on a simple sewing machine needle. The more I sew, and learn about sewing, the more I realize the importance of using the correct sewing machine needle. I've gradually added different needles to my collection: heavy duty, twin, ball point, leather, wing tip, etc. Yesterday, however, I was working with a really fine polyester woven, and I didn't have the correct needle. My fabric was catching, puckering, and pulling. I really needed a different needle. 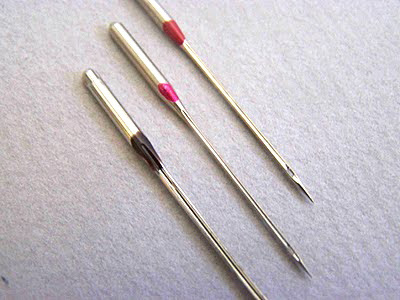 So in an attempt to save you from sewing machine needle frustration, I've found a couple of really great posts that talk about which machine needle to choose. and this little PDF guide from Schmetz might be the best resource of all. A little something extra: Joann's has their sewing notions 50% off this week and next. Perfect time to stock up. I've been meaning to look this up. You really are a mind reader, huh? :) I have universal needles, ball point needles, and heavy duty needles but that's it. Thanks for the Joann's tip. Guess I'll have to go back again, now that Ansley knows people by name there. haha. Love the new site! I have been an rss reader these days but ventured on the click through today, always a good surprise waiting. It looks great, and I love seeing your face there! I am TERRIBLE about using the proper needles for the fabric I sew! I did finally cave and buy some ballpoint needles for knit after hearing you talk about them, but now I can't keep track which is which since I haven't color-coded them yet like you, smarty pants!